Posted by Harri Haukka & filed under Extrasolar Planets, Highlights, Observations. Posted by Harri Haukka & filed under Extrasolar Planets. HAT-P-20b observed at Taurus Hill Observatory. HAT-P-18b was observed at Taurus Hill Observatory. 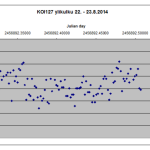 Qatar-1b observed again at Taurus Hill Observatory.